If you’ve been on the fence about using video for your small business, now is the perfect time to take the plunge. The power of video marketing is no longer easy to overlook. Businesses that use video are providing their audience with an easy way to consume information and show off their business. Next to in-person interactions, there’s no better way for your audience to get to know your expertise or personality. 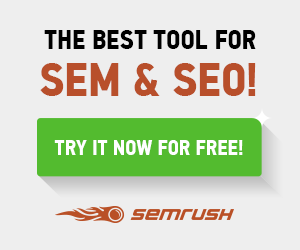 Video can also enhance your email marketing results. According to one report from Wistia, emails with a video receive a 300 percent higher click-through rate than those without! When used correctly, video has the power to improve your email marketing results and make a more meaningful impact on your audience. 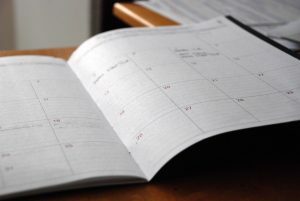 When your business has no shortage of things going on, it can seem overwhelming to keep your audience up-to-date. 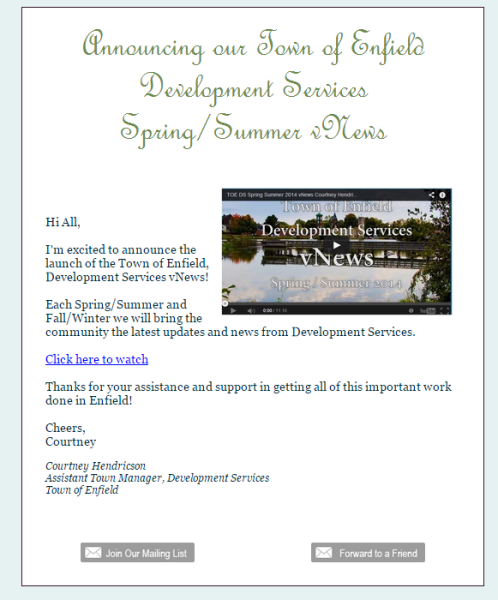 The town of Enfield creates a regular “vNews” video to provide their community with useful updates that they can consume easily. To get the word out about the video, they include a video link in their email newsletter and send it out to their mailing list. 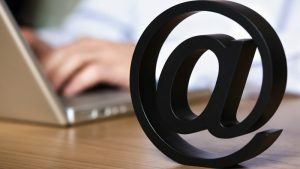 The town’s vNews emails receive a click-through rate that’s four times higher than their average campaign! Taking your audience behind-the-scenes of your business is one of the best ways to develop their trust. Whether you decide to introduce a staff member, share part of your day-to-day routine, or show how a product is made, your audience will gain a better understanding of what makes your business tick and feel closer to you. 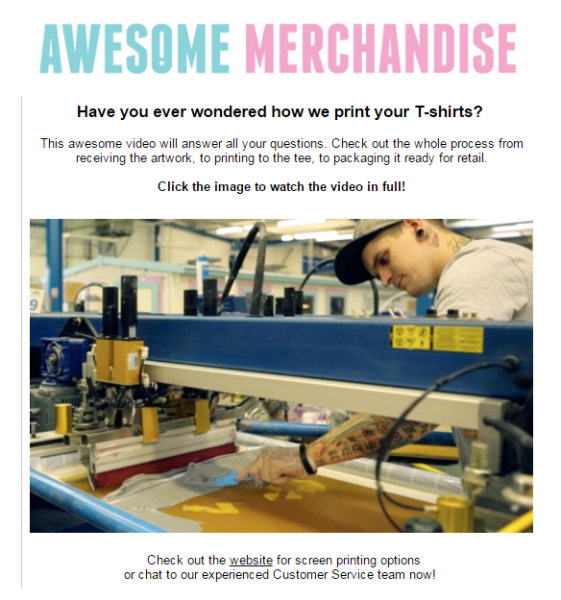 Awesome Merchandise took a video to give their audience a closer look at how their T-shirts are printed and packaged. After uploading the video to YouTube and sharing with their email list, the three-minute video has received over 23,000 views! With the amount of work and planning necessary to pull off a great event, you want to make sure you’re extending its value even after the party’s over. 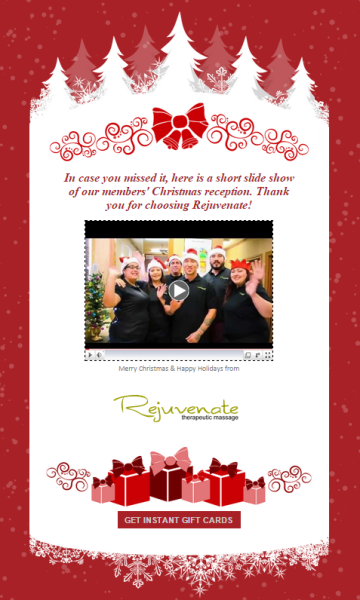 Rejuvenate therapeutic massage did a great job of this by compiling a slideshow of images into a video and sending it out to everyone they invited. This video allows guests to look back at a great time, and also inspires anyone who missed the event to show up next year! Videos have the power to elicit strong emotional responses from viewers. This provides the perfect avenue for nonprofits to share their mission and inspire others to get involved. Even if your marketing budget is smaller than you’d like, you can still harness the power of video by pointing you audience to an existing resource. That’s exactly what the Pajama Program did in their newsletter to inspire donations for Giving Tuesday. Their email campaign includes a video from the Giving Tuesday YouTube Page to illustrate the importance and impact of this day of generosity. 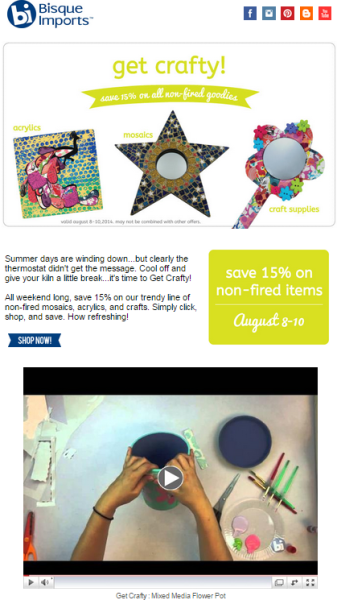 Sparking interest with a preview is a great way to generate excitement for an upcoming product or event. Think about the different ways you can tease your audience. 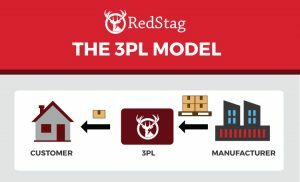 A restaurant could tape a taste test as the staff prepares to introduce a new menu item, or a boutique could take a quick video of a new shipment arriving. Reel Works recently offered their audience a sneak peak of a new documentary. Sparking their audience’s curiosity ahead of time means their audience will already be excited for the film once it is released. After working hard to create a new video, you want to make sure you’re getting as many views as possible. 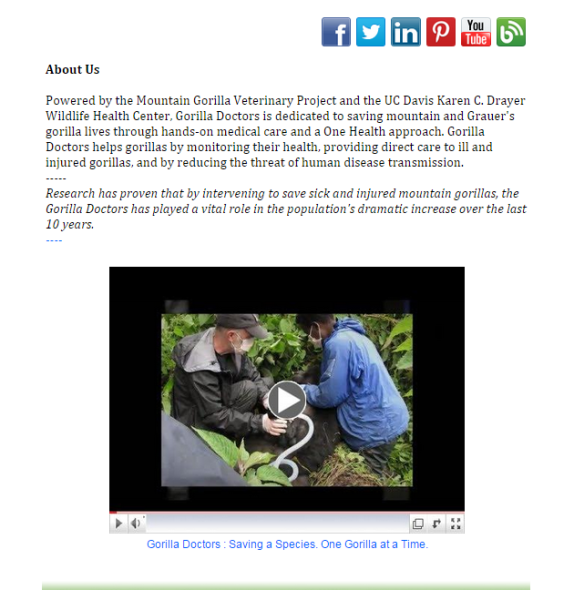 To extend the life of their video, Gorilla Doctors updated their email newsletter footer so the video accompanies their About Us information and social media buttons. 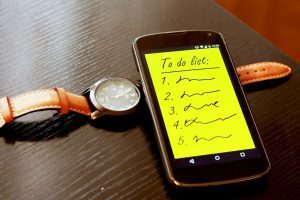 Whether one of their contacts wants to re-watch the video, or a new subscriber is seeing the video for the first time, the video will always be easy to reference and provide a good overview of their organization. Show off your expertise and connect with visual learners by creating a helpful tutorial. 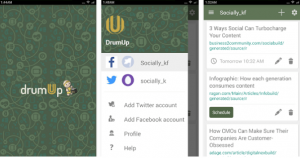 A tutorial can be a great way to show your products in action and educate your audience on best practices. A how-to video like the one below from Bisque Imports provides your audience with a step-by-step approach to creating something of value. 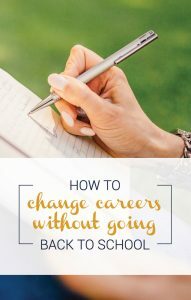 By empowering them to do something on their own, you’re making sure your business will be their first stop when they need help. 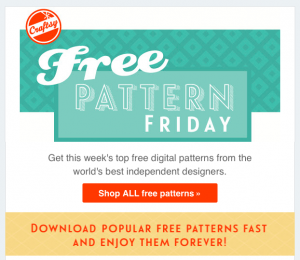 It’s no secret that your customers and supporters love to be appreciated. A personal and heartfelt video expressing your gratitude can be a real WOW! moment for them and make them feel valued. 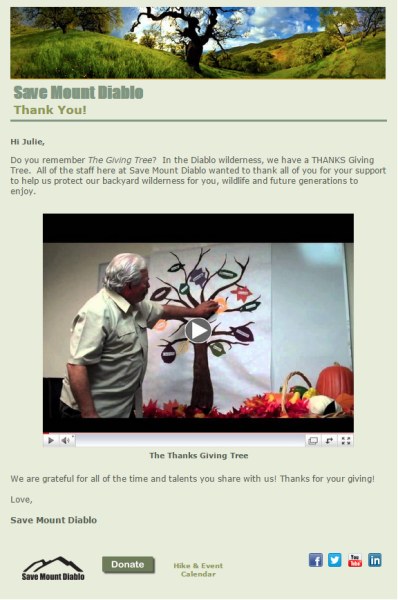 Save Mount Diablo showed their supporters their appreciation around Thanksgiving this year with a short video featuring personal thank you’s from their staff. Showing the people behind your business and providing a personal touch makes the thank you feel genuine and will leave a lasting impression. If you’re struggling to decide how to get started with video, one of the simplest and most effective things you can do is take a few minutes to share your story. 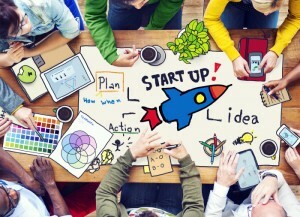 Why did you decide to start your business? What problem or need were you trying to address? What are some of the core values of your business? 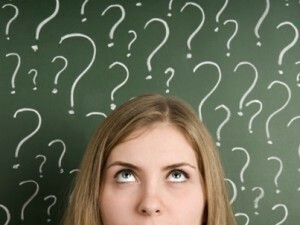 While these answers may seem obvious to you, they might be new information to your audience. Taking the time to share your passion will show them the human side behind your business and how much you care. Fogo Fund created a video to introduce the business, mission, and founders so their contacts could understand why their cause was so important to them. 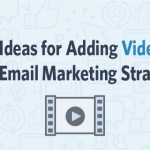 After seeing how nine other small businesses and nonprofits are using videos in their emails to reach their audience, hopefully some of your own creative wheels are turning and you’re ready to give it a shot. Don’t forget that videos can have a great impact on your social media presence as well. 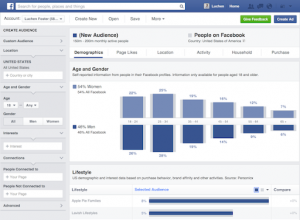 Try adding a video to your Facebook Page, or creating a 15-second clip for your Instagram. Start small by taking your audience behind-the-scenes and showing off a product or introducing an employee. Keep an eye on your reports and analytics to see if video is increasing your audience’s engagement. For more information on setting up a YouTube page, visit our YouTube 101 page. Or, if you have a specific question or story of how video has worked for your business, share it with us in the comments section.